Demand Response (DR) is a simple enough concept: reducing load serves the same purpose as increasing generation when you are balancing the grid. Figuring out the economics of using DR in real time electric markets is unfortunately not so simple. This is particularly true in ERCOT where the threat of scarcity pricing drives many decisions. Forward prices in wholesale energy markets creep higher when generators forego the opportunity to instead sell their energy in real time for $5,000 per MWH, and when REPs face the nightmare of having to settle a portion of their load at such prices. However, when the market becomes over-hedged, real time prices drop. When real time settlement prices stay lower than forward pricing 99% of the time, larger customers begin looking for ways to take advantage of the difference. There are two types of DR. You can simply stop using energy, or you can turn on emergency or backup power sources that replace energy from the grid. For any customer, unique factors drive the calculation of the price at which you would cease taking power from the grid. For many, this price varies seasonally, and can even change daily. A customer that has previously justified the purchase of backup on-site generation to avoid the consequences of a power outage might base his willingness to provide DR based on replacement fuel costs. A customer without such equipment would have to be willing to face lost production and restart costs, yet those costs may be viewed differently depending on inventory levels. DR programs administered by grid operators are driven by a different paradigm, the need to respond to temporary capacity shortages. For a fee, a customer must remove load on demand. However, to be able to remove load, the load has to be online, even if real time prices are far above the level at which a customer would gladly cease taking power. In a market where prices can reach $5,000 per MWH as shown in the graph below on Jan 6th, 2014, participation in such a program would likely preclude taking power tied to real time settlement costs. 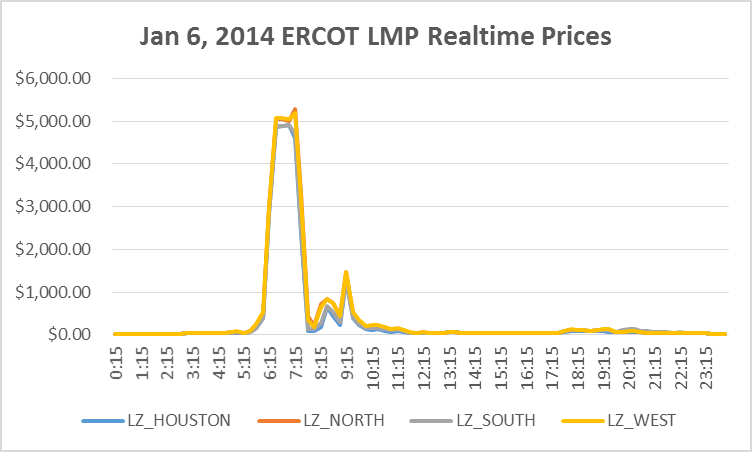 A customer considering DR also needs to consider that ERCOT is a fluid market. As players hedge less and take more from the real time market, real time prices will rise and become more volatile. Further, there are thousands of emergency and backup generators located in ERCOT. If these machines are used to respond to pricing decisions of individual customers, perhaps at $1,000 to $2,000 per MWH, that would make a $5,000 event much less likely. If these machines are instead centrally dispatched by a grid operator, such a natural response will not be observed. Simple, right? So, what is a customer, considering using their DR capability as a way to reduce purchased energy costs, to do? We suggest they start with a conversation with their REP, discuss questions, possibilities, and the ‘what-ifs’. Then you can develop an effective tailored strategy based on the unique circumstances. When the tools available to an REP are matched with the economic realities of a customer, DR can indeed be a winner for the customer.